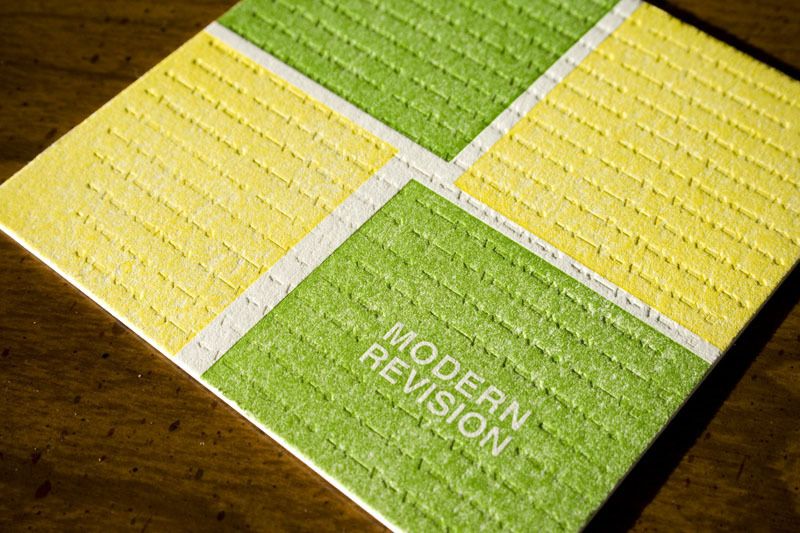 Jody of Modern Revision contacted us in late November to see if we could help him design a promo piece for his company. 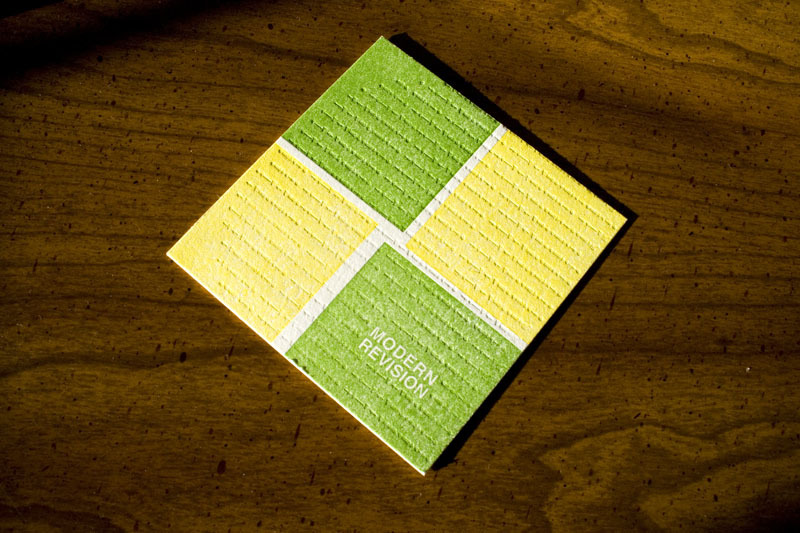 Jody is a furniture designer and is scheduled to show off his stuff at the Interior Design show in Toronto, so he wanted a promo piece that was less of a business card and more of an art piece. His aesthetic is modern with a bit of 50s retro flair, so we tried to incorporate that into the design. Being illustrators, Joel and I first submitted sketches that included modern elements with illustrations. We became fixated on skeleton keys! However the design that Jody chose was the most minimalist and very, very modern. This project was definitely an experiment for us to get out of our comfort zone! We’re very pleased with the result. We did two passes for the green and one pass for the yellow, then blind printed a dingbat pattern over all of it and printed Jody’s info on the back in blind print. The final product. Sketch no. 4 minus the key and the dingbats blind-printed. I’m currently at the Interior Design Show in Toronto and your cards are a huge hit. 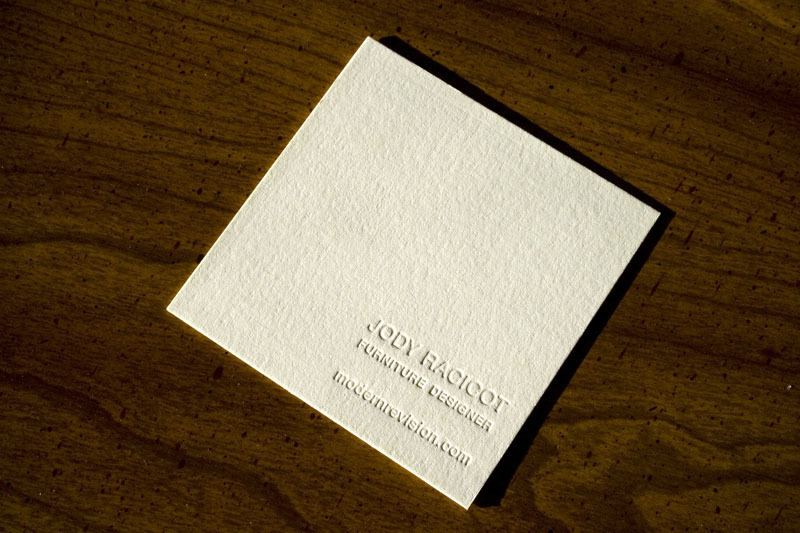 They communicate quality and sophistication that only an elegantly designed letterpress card can. It’s great watching people walk away from my display rubbing the card between their fingers. I went through 500 in my first day of a 3 day show. We’re so glad, Jody! We hope you don’t run out too soon!! !